Patients will benefit from the seca 700. More precision with a higher capacity of up to 500 lbs. Available in various versions: kilograms, pounds and kilograms / pounds and optional measuring rod seca 220 with a range from 24 to 78 inch for time saving weighing and measuring in one step. Equipped with castors for mobile use. Mechanical column scales with eye-level beam, Precise, robust and convenient: both you and your patients will benefit from the seca 700. More precision with the 1/8 lbs graduation and a higher capacity of up to 500 lbs. More convenience from the very flat, large platform and the eye-level beam. The seca 700 is available in 5 other versions: kg only with stadiometer, lbs only with no stadiometer, lbs only with a stadiometer and handle, lbs/kg with no stadiometer, and lbs/kg with stadiometer. The optional measuring rod seca 220 with a range from 24 to 78 inch for time saving weighing and measuring in one step, will be delivered with the scale. Equipped with integrated transport castors for mobile use. Please note; if you have specific requirements that you're looking for in the Seca 700, be sure to consult with us before ordering so we can quote you the proper version of the seca 700. Seca Balance Beam Model 700 scales with a 500 lb. weight capacity are available. Precise, robust and convenient! Patients, doctors, and home users will benefit more from the new seca 700. The Seca Model 700 Balance Beam Scale is the benchmark for the medical balance beam scale market. The Seca 700 Mechanical Balance Beam Scale draws from over 160 years of manufacturing experience by seca. Also, you'll find this is one of the best scales you can find anywhere for your home gym or even your bathroom! 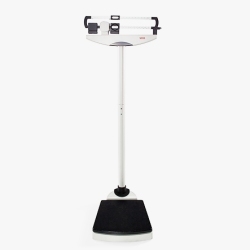 The 13.75" x 14.25" x 3.25" slip resistant platform along with built in 24-78" height rod are just a couple of features that make Seca a leader in medical scales technology. Every scale is checked for accuracy at the factory before shipment. Precise, robust and convenient! Patients, doctors, and home users will benefit more from the seca 700. More precision due to the 0.1 lb graduation and a higher capacity of up to 500 lbs. The included measuring rod has a range from 24" to 78". The scale is equipped with integrated transport castors for mobile use. The seca 700 mechanical column scale with the eye-level balance beam sets new standards worldwide – for capacity, graduation and quality. The model 700 has a cast iron base, iron column, and an easy-to-use interface. Moreover, the compact packaging helps keep freight costs to a minimum. The included seca 220 measuring rod converts the scale into a complete space-saving measuring and weighing device.